Freshdesk.com Free Trial: Is It Worth Trying Out? Freshdesk is one of the most popular help desk software solutions on the market, but it’s always a good idea to try out a product before you decide to invest your money into a given B2B solution. This is important because adopting an inadequately fitted software can have serious consequences on the performance of your business, especially when it comes to help desk that will affect how efficiently you can deal with customer support. That’s why you should always try a free trial of a product first, just to make sure the app will meet all your needs. In this article we’ll give you an overview of how Freshdesk free trial plan works and, to give you some perspective, we’ll also compare free trial plans from a few other notable help desk solutions.If you’re unsure which help desk software will be the best one for your company you can also have a look at our comparison of top help desk solutions in 2019. Freshdesk is by far one of the best help desk solutions available on the market. Our team of B2B experts did a thorough analysis of all major players in the help desk software category and Freshdesk was evaluated as the most efficient and reliable solution of all the ones we’ve tested. After a detailed review Freshdesk gets a first place in our ranking of top help desk software tools. The app is used by more than 50,000 customers including top companies and brands such as Xiaomi.com, Honda, Movember, Cisco, Petronas, Toshiba, Sony Pictures, and UNICEF. Freshdesk offers a great freemium plan for 3 users at no cost and a great free trial that allows you to test all key features of the app. You can easily sign up for Freshdesk free trial here. Freshdesk free trial is available for a period of 21 days. When you sign up for the Freshdesk free trial, you get access to all the features in the Freshdesk Estate Plan. After the trial period is over you’ll get an email from Freshdesk and an option to either choose a plan and pay by credit card to continue using the product or simply to let the account expire. The 21-day free trial is offered with unlimited agents. There are no strings attached and no credit card is required to sign up. You should also consider Fresdesk’s Sprout Plan which is forever free for up to 3 agents, so if you have a small team that doesn’t require any advanced features of Freshdesk you can enjoy the tool at no cost whatsoever. If you want to try out the app on your own you can easily sign up for Freshdesk free trial here. For more details see Freshdesk pricing section in our detailed review of the software. If you’d like to get more information about Freshdesk, its features, available integrations and customer support evaluation feel free to read our Freshdesk reviews for more insight about the app. Desk.com offers a 14-day free trial. The trial period is only half of that offered by Freshdesk.Desk.com’s free trial offers all the features of the Pro Plan. At any time during your trial, you can purchase or downgrade your plan to Standard or Starter. You can opt to continue by selecting a plan and making a payment before your trial expires. If you’d like to learn more about Desk.com features and pricing you can read our detailed review of Desk.com. Help Scout offers a 15-day free trial. No credit card is required to sign up and the trial includes all available features. The 15-day period is much less than the 30-day free trial offered by Freshdesk. However, similarly to Freshdesk if you need only the basics, you can opt for Help Scout’s Free Plan which includes 3 users and 1 mailbox (and fewer features compared to the standard plan). You can downgrade during or after the trial is over. For more information about features and integrations available you can read our detailed review of Help Scout. Freshservice is another product from the same vendor that sells Freshdesk. Similarly, it offers a 30-day free trial. Your free trial starts on the Estate plan with all features offered for free. And even if you do not wish to pay after 30 days, you still get 3 agents free forever on the Sprout plan. You can find more information about this product and its features in our detailed review of Freshservice. Zendesk offers a 30-day free trial. The free trial offers access to all Plus plan features. If you want to try out a different plan, you can contact the vendor directly. You can also explore Plus plan features or learn about the Enterprise plan on your own. No credit card is required to start the trial, you can try out Zendesk with no strings attached. 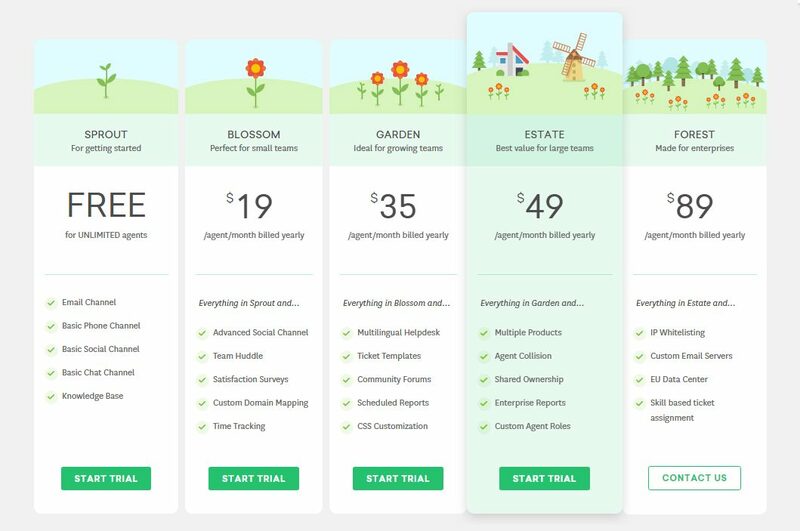 At the end of the trial, you can choose one of the five plans and pay by credit card from within your Zendesk account. Contact the vendor’s sales team if you wish to pay by invoice. Your trial will become your permanent Zendesk account (all of your customizations, actions, and data will remain intact). If you decide not to continue at the end of the trial, your account will simply expire. For more information about Zendesk’s features, pricing and integrations you can read our detailed review of Zendesk. TeamSupport offers a 14-day free trial. Before your trial ends, TeamSupport will remind you about it by email and you can decide if you wish to sign up for a paid account. If you decide not to continue, your account will simply expire after the initial 14 days are over. If you want to get more information about features, pricing plans and integrations available you can read our detailed review of TeamSupport. After analyzing all popular help desk solutions available on the market our experts found Freshdesk to offer the best level of quality in terms of features, pricing and customer support. Freshesk offers a great freemium plan for up to 3 users which is ideal for small teams, and you can always try out the tool to decide if it’s right for your company. You can easily sign up for Freshdesk free trial here. Zendesk Free Trial: Should You Try Out This Help Desk App First? Top Help Desk Software Products: What Are Their B2B Strong Points?